Dublin Zoo has introduced a festive pregnancy test for their white rhinos. They have been feeding different-coloured sparkling glitter to two female white rhinos to keep a check on the hormone levels of Ashanti and Zanta. Bosses at the zoo – who are hoping to breed the animals – added blue and silver glitter to their feed to tell the faeces apart for analysis, reports the Belfast Telegraph. The novel idea has paid off, as early indications suggest Ashanti may be expecting. Toilet Paper Wedding Dress Contest?? A bride has married in a dress made out of toilet [paper]. Jennifer Cannon and her fiancee Doy Nichols from Lexington, Kentucky, tied the knot in a temporary public toilet in Times Square, New York. 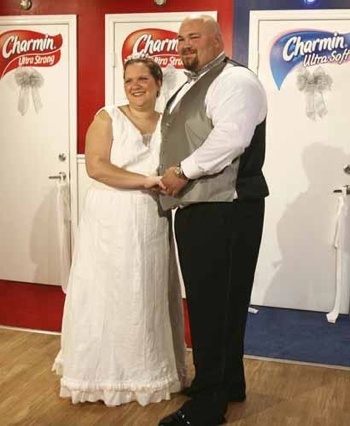 The ceremony has been sponsored by toilet [paper] company Charmin, reports the Daily Mail. The dress was designed by Hanah Kim, winner of the 2007 Toilet Paper Wedding Dress Contest. December 20, 2007 Posted by oldstersview | People, Strange	| Comments Off on Toilet Paper Wedding Dress Contest? ?